This B-17 Flying Fortress, 42-5786, “Whizzer II,” and crew were assigned to the 840th Squadron of the 483rd Bomb Group. On April 15, 1944 “Whizzer II” was shot down by flak over Nis, Yugoslavia. On January 11, 1950 three crewmembers were buried in Section E Site 221-222 at the Zachary Taylor National Cemetery. 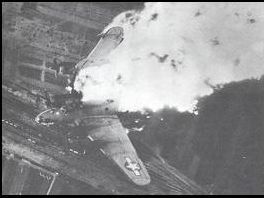 The plane received a direct flak hit, was engulfed in flames and the right wing came off. An alert 483rd photographer captured this moment, providing one of the most horrific photos of World War II. B-17 42-5786 was a war-weary that had served with the 99th Bomb Group. This was the first crew and plane lost in combat by the 483rd. No parachutes were observed, but only nine bodies were recovered from the plane. Members of the 840th Squadron who were consulted indicated there were no survivors. The target was the marshalling yards at Nis, Yugoslavia. 41 aircraft were on the mission. They missed the Initial Point and their bombs (106 tons of 500 pounder general purpose) overshot the target. The plane took off at 2008 hours from Maison Blanche in Algeria for Operation Coastline to drop an Italian Resistance man and supplies at DZ “Mockingbird” in the vicinity of Crescentino, about 33 km NE of Turin at 45 degrees 20’25”N, 7 degrees 30’32” E. Aircraft crashed about 2300 hours into the mountainside at Clos de Carle SW of the Pointe de la Corne de Bouc following errors in navigation and adverse weather conditions. All the crew were killed. Air Force special operations forces (AFSOF) have ebbed and flowed since they were established to support our World War II (WW II) Allies in the North African, Mediterranean, European, and China-India-Burma theaters. AFSOF forces were also very active in the Cold War, Korean War, and South East Asia (SEA) War. The earliest missions involved the Special Flight Section of the 12th Air Force's 5th Bombardment Wing in North Africa in October 1943. This small adhoc unit operated highly modified and mission unique bombers into France and other parts of occupied Europe. Later they evolved into the 885th Bombardment Squadron (Special) and flew out of Brindisi, Italy, into Yugoslavia. The largest Army AFSOF effort in Europe was conducted by the 801st Bombardment Group (S) nicknamed the "Carpetbaggers," and was based in England. They operated mostly long-range bombers backed up by medium bombers and transports. The above units dropped supplies and parachutists to allied partisan and guerrilla units. They also air landed behind enemy lines to drop off personnel and supplies and recover hundreds of shot down allied aircrew. In late 1943 the 1st Air Commando Group was organized and went into combat in March of 1944. Set up to perform a variety of conventional and unconventional combat and support missions deep behind enemy lines they used an array of aircraft including transports, fighters, bombers, light planes, gliders, and helicopters. They accomplished the first AAF behind the line night airfield seizure and combat rescue with a helicopter. All AFSOF units were disbanded at the end of WW II. Following the German victories in Europe, patriotic elements arose in virtually every occupied country. The Allies encouraged these groups, popularly known as the "underground" or as "partisans," to organize, gather intelligence, and resist. As early as 1940, the British government established the Special Operations Executive (SOE) to aid them. Later, in 19 42, the Americans followed with their own Office of Strategic Services (OSS). The activities of both of these organizations came to be called "special operations." In the Mediterranean theater, special operations started slowly. Before September 1943, the Allies conducted them on a limited scale, flying only a few missions into France. But Allied agents, acting with the French resistance, soon pressed for more. Faced with expanding special operations, the RAF formed the 334th Wing in November 1943 to command almost all special-duty aircraft in the theater. When Baker arrived in the Mediterranean at the end of 1943, he ex pressed an interest in special operations and arranged for an American unit, the 122d Liaison Squadron, to participate. Additionally, in February 1944, two squadrons of the 62d Troop Carrier Group arrived in Brindisi, Italy, to support the Balkan partisans. Flying C-47s, they airdropped guns, ammunition, dynamite, food, clothing, and medical supplies to the partisans waiting below. When landings became possible, gasoline, jeeps, and even mules were quickly unloaded. In a typical mission, the Americans dropped thou sands of pounds of ammunition and supplies, several SOB/OSS agents (called "Joes" and "Janes"), and hundreds of thousands of leaflets. The C-47s solved a critical supply situation that the RAF 334th Wing, always short of aircraft, could not solve. Flying sorties in central and southern Yugoslavia, Albania, Greece, Bulgaria, and northern Italy, often in dangerous winter weather, the Americans dropped nearly 400,000 pounds of supplies and leaflets and numerous personnel in February and March 1944. A few weeks later, the original squadrons wearily welcomed their relief when four new C-47 units of the 6Oth Troop Carrier Group took over. The cargo pilots faced harrowing problems. They flew mainly at night and frequently had difficulty spotting the primitive landing strips in narrow valleys surrounded by peaks and ridges. Many of these fields could be approached from only one direction and failure on the first attempt could mean a wrecked aircraft and death. Despite the dangers, the number of night landings and escorted daylight sorties steadily increased. Between April and October 1944, the 60th Troop Carrier Group made more than seven hundred landings, almost all in Yugoslavia. Much of that support went to Marshal Tito (Josip Broz), a Yugoslav partisan leader locked in a savage struggle with the German invader. One typically dangerous mission involved delivering twenty-four mules and twelve 75-mm guns to Tito's partisans in Montenegro. Flying on instruments through terrible weather, the pilots slipped between two jagged peaks to a safe landing. In October 1944, the AAF assigned heavy bombers to augment the transports, and the 885th Bombardment Squadron began flying to distant points in northern Italy and Yugoslavia. Until the end of the war, American units continued supplying partisan bands wherever they fought, from remote mountains and valleys to the teeming cities of Belgrade, Zagreb, and Sarajevo. The Italian resistance movement differed from its Yugoslav counter part. In Italy, partisans took a supporting role while Allied and Axis forces fought on major battlegrounds along a well-defined front. The anti-fascist guerrillas harassed German lines of communication, protected Allied agents, gathered information, and helped downed airmen evade capture. After the invasion of southern France, the United States increased its support for the Italian partisans. flying first from North Africa and later from Italy, the 885th Bombardment Squadron dropped tons of supplies to resistance forces in the Po Valley. Supply drops increased dramatically when the 62d and 64th Troop Carrier Groups joined the effort. Partisan at tacks on the enemy also increased. field Marshal Kesselring reluctantly diverted nearly 40,000 troops from his crumbling front to suppress the guerrillas. Although the Germans killed or captured hundreds of partisans, they were unable to crush the resistance movement. American-supplied partisans continued fighting Germans in northern Italy until the war ended. As the tempo of Balkan operations intensified, the MAAF faced the problem of evacuating increasing numbers of downed Allied fliers. Many aircraft did not return after missions against heavily defended targets. Fortunately, some aircrews parachuting from damaged aircraft or surviving crash landings came under the protection of the underground, which fed them, cared for their wounds, hid them from the Germans, and frequently helped them reach the Adriatic coast. When possible, partisans led downed airmen to secret airstrips where special operations aircraft flew to them to safety. In late July 1944, Eaker directed the Fifteenth Air Force to form Air Crew Rescue Unit No.1, an outfit specifically devoted to rescue and evacuation. During the night of August 2/3, in a mission typical of many flown until war's end, the unit dropped a field party fifty-five miles south of Belgrade, where roughly one hundred airmen had assembled. The rescuers immediately set to work on a landing strip. Six days later, C-47s evacuated nearly three hundred men there. Later in August, when Romania abruptly left the Axis and joined the Allies, the Fifteenth Air Force learned of more than one thousand American airmen held in prison camps near Bucharest. The POWs faced imminent deportation to the Third Reich. Hurriedly converting 56 B-17s into transports, the Italy-based fifteenth Air force mounted Operation Re union. As the newly converted transports touched down near the camps, the former prisoners surged forward, happily crowded into the B-17 s, and were flown to safety. The special operations units, using equipment and techniques adapted to their peculiar operational problems, took on a certain aura that distinguished them from normal combat units. Bombers and fighters made headlines, but the work of special operations personnel remained secret and apart. The looks of relief on their passengers' faces kept morale high and added immeasurably to the pride they felt in flying these dangerous but unsung missions. In the night of September 12 to 13, 1944, B-24 serial 42-78243, called "Dallas Lady", crashed against the abrupt wall of the Corne de Bouc, mountain located on the commune of Fontan, in the valley of Roya (department of the Maritim's Alps). Its mission was to drop containers and packs to the underground of Allessandria's sector (N/E of Piemont, north Italy). Their mortal remains were recovered by the German soldiers who brought them to the civil cemetery of Fontan. Just after the war, the bodies were exhumed and moved, by the American services of identification, to the military temporary cemetery of Luynes (Rhône's valley). Now, the crew rests in US cemetery Zachary Taylor, Louisville, Kentucky. The wreck of B-24 "Dallas Lady", until 1991 (year of its recovery) was single due to the quantity and the quality of the wrecks still in place and largely disseminated in an imposing fall. Following the research made in collaboration with J. K Mattison in the USA, A. Ramoin, A. Fine, R. Cohen, S. Poliakovic, then, thereafter, with A. Poggi, president of veteran of AFN. of Beausoleil, that the most imposing memorial of the Maritim's Alps department was raised. In this day of September 14, 1991 most families of this crew found thanks to Liliane Kell were joined together at the bottom of the peak of Corne de Bouc, for one of most important inaugural ceremony (mediatization, number of people and elected officials present), who was given us to assist! This B-29, 42-63423, and crew were assigned to the 870th Squadron of the 497th Bomb Group. They were shot down January 27, 1945 over Tokyo. Five members of the crew were buried in Section E Plot 18 on January 22, 1949 at the Zachary Taylor National Cemetery. This is the story of the 497th's final lonewolf bombing strike against Tokyo on January 27th, 1945 when B-29 missions were still in "short pants"; when Superfort fliers were giving their minds, their hearts, their lives to the task of putting the Superfortress in full dress, preparing Japan for a shroud; when there was no friendly Iwo to set down on in emergency; when there were no Mustangs to ward off the waves of murderous enemy fighters. It's the story of how 497th crewmen--guys like Avery, who barely made it back; McDonnell, Peterson, Dauth, and Hahn and their crews who didn't--met and fought off the bulk of the greatest aerial attack the Japanese have even been able to mount against Superfort Task Forces; how they went on to bomb their target and how those who returned to base sincerely hoped, but did not realize, that what they went through that day, other fliers would be spared. They had met the measure of Japan's homeland air force. Never again were the Japanese able to put up a defense as severe as that which battered at the tiny force on January 27th. Crewmen who flew on that mission will be spinning this combat yarn alongside fireplaces, over bars and in shops and offices as long as any of them are above. Tokyo, January 27th is to men of the 497th what the Iwo Jima battle is to Marines; what the "Battle of the Bulge" is to men of the European campaign; what "Schweinfurt" is to American men who bombed Germany. Today, in talking to crewmen who flew on that mission, one has only to ask "which was your most difficult mission?' or, casually, in an ice-breaking manner, mention the January 27th strike and crewmen either begin gesturing wildly with their hands to describe the fighter attacks which their bomber had to withstand or they stare off into space blankly, remembering with squinted eyes and clenched Jaws--but saying nothing. Major Walter L. Geyer (Mena, Arkansas) summed up the average crewman's opinion of the mission: "Over the target I clearly remember saying to myself as we ploughed through fighters and flak, "If I ever get out of this one I'm through flying"--and at that moment I really meant it." The heroism, the gallantry, the sacrifices, the fear and the elation, and finally the results achieved, are all blended to make one of the most courageous tales of the Pacific War. On this day the back of Japanese opposition was broken. For later, as fleets of 700 and more Superforts pounded Japan from the Marianas, Nip anti-aircraft fire was comparatively light; Jap fighter opposition practically negligible and Superfort forces smashed at dozens of cities with extremely light losses. This air warrior's dream was never realized until the minions of the empire who protected "Flak Alley: were met and vanquished in the fiercest battle ever to take place over Japan. January 27th was the last day that the 497th and the remaining units of the 73rd Wing struck at Japan alone. On the very next mission, the 313th Wing, based on Tinian, joined with the 73rd to bomb Kobe. Though Group after Group was added to the growing air war against Japan, none has a battle story to equal the one which the 497th wrote on January 27th. The 497th and its companion Groups of the 73rd Wing had bombed Japan from Saipan. Its crewmen flew through all kinds of weather, tested all types of air battle and bombing tactics, stored up all kinds of experiences and information to be passed on to newcomers in this newest of wars: the Air War against Japan proper. Mission after mission as the Wing flew on alone, the intensity of Japanese fighter plane and anti-aircraft gunfire increased. December 4, Wing crewmen fought off 75 attacks at Tokyo and bombed their target.. December 27th they blasted their way through 508 attacks, shot down nine fighters and dropped their bombs on another Jap war plant at Nagoya. January 23 they again hit Nagoya after smashing aside 626 attacks and shooting down 32 fighters to get to the target. In its first two months of operation from Saipan, between November 24th and January 23rd, the Wing fought off more than 3,500 fighter attacks. There was an average of four attacks against each plane bombing during this period; Wing gunners shot down 106 fighters. On January 27th the peak in Jap fighter attacks against B-29's was reached. To bomb the dock area of Tokyo through a heavy undercast, sixty-two Superforts of the Wing ploughed through 984 Jap fighter plane attacks--554 of which were against the 497th. Of the more than 350 Jap planes which attacked, 60 were shot down (34 by the 497th) and 56 were probably shot down (32 by the 497th). Nearly one-tenth of all the fighters shot down by Mariana-based B-29's in approximately 300 missions were destroyed that day. Nine B-29's were lost during the mission; the greatest number of planes the Wing ever lost on any mission; the greatest number any Wing lost to enemy aircraft on a single strike-- and five of these great ships and four of their gallant crews were stricken from the rolls of the 497th. Destroyed Superforts were spread from Honshu to Saipan. The 497th, leading the Wing, was first over the target and therefore bore the brunt of Jap fighter and A/A opposition. Seventeen of our planes crossed the Japanese coast ant turned to make their bomb run. Two were sent down by Jap fighter bullets; a third just disappeared over the target; a fourth plunged into the ocean 250 miles off the coast of Honshu on the return flight and a fifth crashed at base and was destroyed. Thirteen of the 17 crews returned safely and of the twelve planes landing safely, eight suffered extensive battle damage. This pitifully small force had to fight off 554 separate attacks for an hour and a half along a 150-mile route. Of the more than 260 planes which made these attacks on the Group, 34 were shot down and 21 were probably shot down by the eagle-eyed gunners who fired upwards of 70,000 rounds of ammunition. The Japs were waiting for the force. They knew it was coming even before Superfortress Crewmen spotted the towering heights of snowcapped Mount Fuji. About 300 miles from the coast of Honshu the tight formations of low flying Superfortresses were detected by two Jap patrol boats. "When the boys saw the boats they knew they were going to get a different type of show at Tokyo that day." said Major Pershing L. Yon (Tallahassee, Florida) who piloted a B-29 on the mission. The patrol boats which had been cruising on the exact course to Honshu, were able to radio an hour's warning that B-29's were speeding in to smash at the homeland once again. That was word enough for Jap fighter pilots. With a whole hour in which to check ammunition, gas-up, warm up their planes and climb to the five-mile altitude of the incoming Superforts, planes from all over the Tokyo-Nagoya area were alerted in time to speed down Nip runways well before the 497th even sighted land. Hundreds of Jap fighters of all types and with all manner of markings were thrown into battle that day. Fighters from the new, slick jet-black Irvings, down to single-engine, obsolete craft, boiled skyward to smash into the just-arriving Superforts. The Japs even tossed in a medium bomber for good measure. As Jap pilots jabbered last-minute instructions to their ground crewmen for readying their planes, two B-29's, flying an hour ahead of the main force, were already scouting Nagoya and Tokyo to determine which city had the best bombing weather. As the 497th crossed the coast-line, two separate "clouds" were seen in the distance--one was caused by hundreds of bursts of heavy Jap anti-aircraft shells; the other by the Jap fighters, which were already at B-29 altitude, waiting for the force to move down toward the target area. "Heavy guns were spotted all along the very path we had to travel to the target," said Major Thomas J. Hanley III (Mansfield, Ohio), one of the commanders of the first formation. "That was the day this course into the target got a name which has stuck with it ever since: 'Flak Alley'." However, not all of the Jap fighters waited for the Superforts to reach the target, for just as the first formation broke into sight of the coast-line, five Jap planes pounced and fired a few shots as if in formal opening of the two-hour aerial battle which was to follow. Then they drew off and radioed vital information concerning the B-29 force to the waiting fighters and flak batteries. Speed, altitude, number of planes in the formations, all this was neatly set in the mind of each Jap pilot and lanyardyanker before they even saw a Superfort. The bell clanged and the 497th formation stepped out of its "corner" in a fist-cocked, determined manner as it wheeled around Hammamatsu and plunged for the city of Kofu, the last turn before the target. Fighters and bombers met head-on. In ones, twos and threes they came, some whining in from below to spray the bellies of the bombers; others driving vertically from high above the formation to cut off and strafe the Superforts from wing-tip to wing-tip. As many as eight or nine fighters dove in at once to attack a single B-29, spinning, turning, gliding, firing, some skimming within inches of the wings and fuselages of the giant plane. A Jap "Tony" fighter attacked Major Hanley's plane from high on the right side. All guns were on him and blazing away when a "Zeke" roared in from below the bomber on the same side and strafed the entire right side of the fuselage. Inches lower and his bullets would have dug into everyone on that side of the plane. Lieutenant Alvin Garver, Flight Engineer in Hanley's formation from Hartford, Connecticut, decided to sit only on his life-raft that day--instead of a heavy pillow AND the life-raft. Jap fighter bullets crashed into the plane two inches above his head. Flames leaped from the loaded bomb bay of a B-29 which had sustained fighter and flak hit. It shuddered, slowed down. Then its pilot, Lieutenant Walter S. McDonnel (Duluth, Minnesota), tried to speed it forward to gain the protection of the formation. It dropped back once more and was last seen veering to the north toward the protection of cloud banks, its bomb bay fiercely on fire and hopelessly in trouble. After the war was over and American prisoners in Japan were returned to the U.S. the only two airmen from the 497th shot down in battle even to be returned, were from this airplane. They were Sgt. Clinto F. Lodovici, tail gunner and Staff Sgt. Vere D. Carpenter, radar operator. The fighters pounced on a second plane in the formation, flown by Captain Elmer G. Hahn (Idaho Falls, Idaho), which was straggling. Flames found the Bombs and the giant bomber exploded and broke in two. The front half of the plane, completely engulfed in flames plunged quickly to earth while the rear half seemed to float in the air. Then it too exploded. Thousands of rounds of ammunition from many Superfort guns ate into the attackers and as the 15 remaining planes of the Group moved deliberately forward to their target, the air was filled with earthward-bound pieces of broken planes--Jap and American alike. Some Jap pilots, in typical suicide fashion, ignored the sledgehammer-like fire directed at their planes and flew straight down the streams of smashing Superfort bullets to explode within a few yards of the target-bound bombers. In rapid succession, five fighters were shot down by the guns of a single B-29. Jap flak got another and guns from three different airplanes blasted a seventh Jap from the sky in seconds. The Japs were good, but the B-29 gunners were better and the intricate and new central fire control systems of the huge planes were living up to their pre-battle praise. A gunner would no sooner finish off one Nip plane than another would speed in to take its place in the attack. As a juggler keeps his eye on a dozen plates in the air at one time, so did B-29 gunners on January 27th have to follow the determined Jap fighter planes--only plates don't spit ugly 20 millimeter explosive shells, belch hundreds of round of smashing, high-caliber bullets, and you have to smash Jap fighters to drop them. An official Wing report formally understated, "When considering the confusion that must have resulted from the frequency of attack, it is believed that gunners displayed excellent control." Gun barrels were red-hot and some of them were burned into uselessness even before the planes got to the target, so intense were the Jap fighter attacks. In some cases, too, guns ran dry of ammunition in a vital turret and airplane commanders had to flip their mammoth planes from side-to-side to allow guns which still had full ammo belts to be brought into the battle. With two of its planes already gone, the small formation, still under fierce attack, flew steadily forward. The formation rounded Kofu, a small town west of Tokyo, and bore down on the capital, 100 miles away. Then a third bomber, piloted by Captain Raymond C. Dauth (Paso Robles, California), was hit. It lurched, tried to swing back into formation but instead, plunged slowly out of its place in the attack group, its crew trying desperately to control the fire which had burst from the bomb bay. It continued to fly away from the formation and was never seen nor heard from again. Again the hole was plugged by another reshuffling. And still the fighters came. In lightning fashion two Jap fighters rammed another Superfort in the dwindling formation. One dove straight down on the bomber and sliced off eight feet of its aileron; another ploughed into the tail and sheared off the entire left stabilizer. The B-29, flown by Captain Lloyd Avery (Long Beach, California), dropped 8,000 feet out of control, was finally pulled out of its dive and it scooted for the coast-line and out to sea, fighters attacking all the way. Only with the skill and courage of their gallant crews did the formation fight through and reach the target. Finally, with bombs away, the group swung to the right and in precision formation followed the prescribed course out over the coast-line and headed back for Saipan. About 250 miles from Japan on the homeward run, the courageous little group lost another of its planes. Jap bullets had caused a leak in one of the giant plane's gas tanks and because of lack of fuel, Captain Dale W. Peterson of Portland, Oregon, "landed at sea." At dawn the next morning B-29's were already scouring the waters off Honshu for the mission crew. The plane was seen to have made a successful "ditching." Squadron mates who followed them to give assistance, saw crewmen standing on the wings as the bomber rocked in the water; saw men crawling into life-rafts. Then, for five days, a storm ripped along Japan's eastern coast. The crew was never seen again. For a week after the ditching, planes from the Group flew from Saipan to the locality where the crew was last seen and patrolled from 15 to 18 hours a day. They flew at altitudes of 500 to 1,000 feet, between and around thousands of Jap-held islands in the area, all eyes scanning the waters for some trace of the mission crew. Had there been an Iwo Jima at this point in the B-29 campaign, the men might have been saved; might have been spurred on, as have many crews since, to wring a few more impossible miles out of their heavily damaged craft and sputter into airfield-packed Iwo.